This basket is perfect for any occasion. We start with 20 pieces of US #1, Extra Fancy fruit. Then we add gourmet cheese, crackers, pepperoni, crunchy breadsticks and mustard. 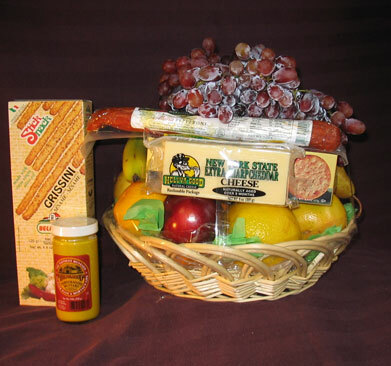 Some of the gourmet items are imported or made right here in NY state. We top it off with a fresh bunch of grapes, wrap it tight with cellophane and put a handmade bow on top. Impress your family and friends with this grand presentation. Makes a great gift.